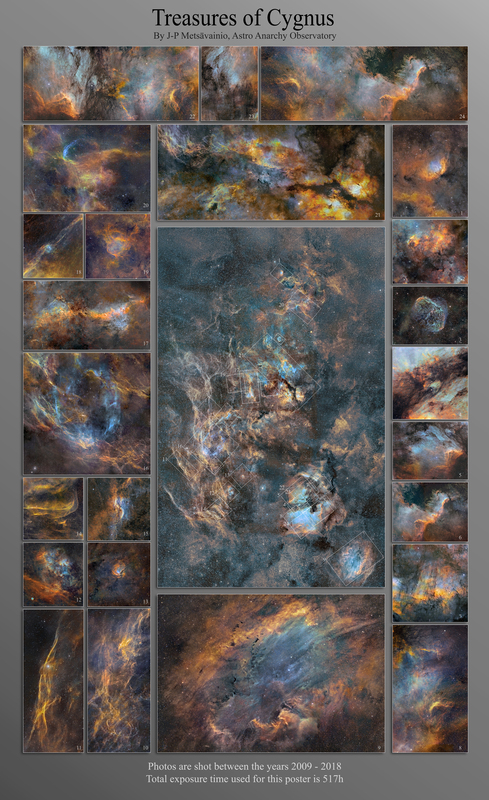 I made a poster format collection out of my photos from constellation Cygnus, the Swan. This area of sky is full of wonders, emission nebulae, supernova remnants, planetary nebulae, complex networks of dark nebulae and many other objects and cosmic phenomenon. I think I can spend rest of my life by shooting this nebula complex, it's a source of never ending wonders and visual treasures. Please, click the image to see a large version, it's worth it! A location for each photo is marked at the large mosaic image of constellation Cygnus at center. At center of the poster there is a large mosaic image of constellation Cygnus. I publish this 18-panels narrow band mosaic image at 2011.